WASHINGTON, DC, August 30, 2012 (ENS) – The Obama Administration today gave Shell approval to prepare for oil drilling in environmentally fragile Chukchi Sea off Alaska although a critical oil spill containment vessel has not been certified. Shell will be permitted to start “certain limited preparatory activities” for drilling off Alaska’s northwest coast, Interior Secretary Ken Salazar told reporters. Salazar said that Shell can construct a 40-foot-deep structure needed to install a blowout preventer, a stack of valves intended to keep oil from entering the water in case of a well blowout. He said Shell also would be allowed to drill a “top hole” as deep as 1,400 feet and set steel pipe and concrete. “Today’s action does not authorize Shell to drill into oil-bearing reservoirs,” Salazar said. Shell has said the shallowest oil-bearing reservoirs are about 4,000 feet deeper. Shell was allowed to move forward because time is running out before ice closes in at the drill site in the Chukchi Sea 70 miles offshore of the coastal town of Wainwright, Alaska. 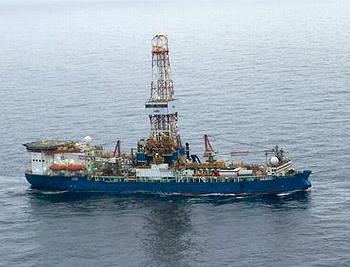 Shell’s drillship Noble Discoverer is expected to arrive at the Chukchi exploration drill site late Friday. 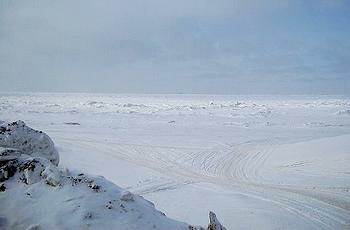 Shell had applied for permission to drill five or six exploratory wells in the Chukchi and Beaufort seas this season. But before Shell drills into oil reservoirs, the company will have to complete the certification required by the BSEE of the Arctic Challenger, a 4,700-ton spill containment vessel being refitted in Bellingham, Washington. Salazar said Shell estimates that the Challenger can be certified within five days. Shell has said it would take two weeks to move the vessel from Bellingham to the drill site. The Interior Department has said that Shell would not be allowed to drill in the Chukchi Sea past September 24, which would leave enough time for a relief well to be drilled in the event of a spill. The deadline is October 31 in the Beaufort Sea to the east. A federal lawsuit to force release of “crucial” safety data on response to an offshore oil rig blowout in Arctic waters was filed today by Public Employees for Environmental Responsibility, PEER. The national group representing workers in government resource agencies says the unreleased testing data would shed light on whether there could be a repeat of the disastrous 2010 Deepwater Horizon blowout in the Gulf of Mexico from the first wells to be drilled this summer on the Arctic Outer Continental Shelf. Following the BSSE press release, Rick Steiner, a retired University of Alaska professor and PEER board member who is an expert in oil spill response, requested the actual Shell cap test data under the Freedom of Information Act. BSSE has not produced the data within the statutory time limits and today PEER, representing Professor Steiner, filed a lawsuit to compel release of the testing results. “That DOI is delaying release of the results, and Shell is poised to begin drilling its first Arctic Ocean wells within days, underscores the urgency here. This is why we needed to sue to obtain the results,” Steiner said. The GAO report found that the Interior Department has no definitive process for insuring both the availability and the reliability of blowout prevention and response equipment. The report also stressed the “unique risks” of Arctic offshore drilling, including floating ice, scouring ice that shears along the ocean floor, and lack of any emergency infrastructure in the frigid, remote seas. “Given its track record, Interior cannot just say ‘Trust us, we have this covered,’ said PEER Staff Counsel Kathryn Douglass, who filed the legal action today in U.S. District Court for the District of Columbia. “Complete transparency on this paramount issue is essential for public confidence that the federal government is not again accommodating oil companies at the expense of protecting irreplaceable public resources,” said Douglass. PEER also has urged that the Interior Department require redundant back-up systems as the Canadians do to prevent the nightmare scenario of a runaway spill under impenetrable sea ice from a blowout at the end of the short drilling season. PEER says Interior has rejected multiple response requirements, instead relying on the single capping stack system now being towed to the Arctic.